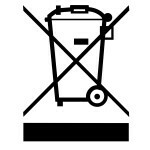 The crossed-out wheeled bin symbol means that this product should not be disposed of in your general household waste. Waste electrical and electronic equipment may contain hazardous substances which, if not treated properly, could lead to damage to the environment and human health. Instead, please contact your local authority for information on suitable collection sites and recycling facilities, or contact your local retailer who, in exchange for your buying an equivalent new product, may take back this product for free for recycling. This way you will be helping to ensure that the equipment is properly treated and its parts recovered, recycled or reused in an environmentally friendly way.